Posted on December 9, 2013 by Amanda D.
Disclaimer: I know there is already a book vs. movie post about Catching Fire on here. I just thought it would be nice to give you guys a review from a different perspective. Attention lovers of the Hunger Games, dystopian fiction, and Josh Hutcherson everywhere! If you have not seen “Catching Fire” the movie, or read Catching Fire the book, I suggest you run out to your nearest bookstore, and buy this book and a movie ticket to go along with it. If you have already read the book and are worried that the movie will not live up to your expectations of this literary masterpiece, do not be afraid. “Catching Fire” the movie was just as good as Catching Fire the book. Now, I know what you all are thinking. “Books are always better than the movies they are made into. Why is ‘Catching Fire’ different?” I’ll tell you why. #1. The dialogue in “Catching Fire” the movie is almost word-for-word the dialogue in the book. It was like the scriptwriter had the book open next to him the entire time he was writing the script. I really appreciated this, as I felt like the writers really took into consideration the fans of the book. #2. Josh Hutcherson actually has lines. Now, I know some of you are Liam Hemsworth fans. Yes, he is attractive, but I prefer Josh Hutcherson. (Don’t judge me.) In the “Hunger Games” movie, he barely had any lines. This sort of ruined the movie for me. However, in “Catching Fire” he was able to live up to his full acting potential, and fully embody the character of Peeta. #3. The arena is flawless. Without spoiling anything for those who haven’t read the book, let me just say it was exactly how I pictured it. My friend agrees and she is basically the harshest unpaid movie critic out there, so trust me on this. Regardless if you are die-hard fans of the books, or first time viewers, I strongly suggest you get off your butts and take a risk and see this movie! 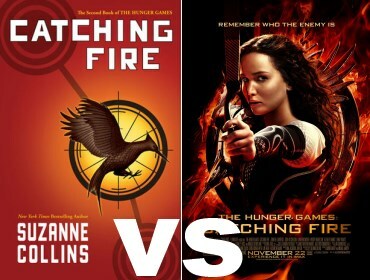 This entry was posted in Book vs. Movie and tagged Book vs. Movie, suzanne collins by Amanda D.. Bookmark the permalink. nice job listing the points of interest. It was easy to read and gets your point across. Thanks Stephanie and Sabrina! And Sabrina, I am so excited for Mockingjay to come out and I think that with it being split into two parts we will see even more details that were in the book. Can’t wait!